Ganesh Haloi was born in Jamalpur, Mymensingh, now in Bangladesh in 1936. He moved to Calcutta in 1950 following the Partition. The trauma of the uprooting left its mark on his work as it did on some other painters of his generation. In 1956, he graduated from the Government College of Art and Craft, Calcutta. The next year he joined the Archaeological Survey of India to make copies of the Ajanta murals. After seven years, Haloi returned to Calcutta to work. From 1963 till his retirement, he taught at the Government College of Art and Craft. Since 1971, he has been a member of the Society of Contemporary Artists. The experience of Ajanta influenced Haloi profoundly and his works showed an innate lyricism. Haloi worked in many mediums and initially painted figures in landscapes. The mood was poignant. Gradually, he shifted focus to landscapes. A sense of nostalgia for a lost world pervaded these paintings. 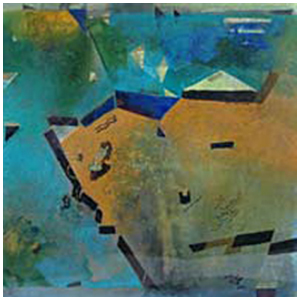 Eventually, Haloi concentrated on abstract renderings of landscapes. Dots, dashes, lines became cryptic signs for trees, water, green fields. 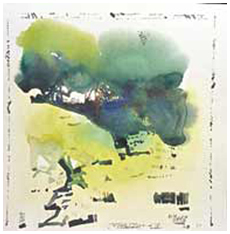 A refreshing interlude came when Haloi did some architectural paintings following a tour of the ruins of Gour Pandua in north Bengal. He has also done a number of commissioned mosaic murals. He lives and works in Calcutta.